b Twa dee'd soon efter birth. 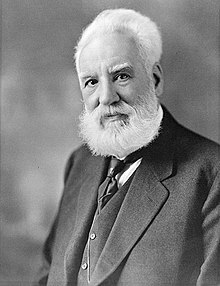 Alexander Graham Bell (3 Mairch, 1847 – 2 August, 1922) wis a Scots scientist, inventor, an foonder o the Bell Canada, that wis kent as the faither o the telephone. As weel as his wark in telecommunications technology, he wis responsible for important advances in aviation an hydrofoil technology. ↑ Bell an his parents immigratit tae Canadae in 1870, but Canadian ceetizenship did nae exist formally till 1910; aw immigrants frae the UK remeened "Breetish subjects". Canadae wis Bell's domicile frae 1870 tae 1871 an, awtho sent bi his faither to teach in Boston, Massachusetts, perhaps ayont. He becam a U.S. ceetizen in 1882. ↑ Gray, Charlotte (2006). [Alexander Graham Bell at Google Books Reluctant Genius: The Passionate Life and Inventive Mind of Alexander Graham Bell] Check |url= value (help). New York: Arcade. p. 419. ISBN 1-55970-809-3. Wikimedia Commons haes media relatit tae Alexander Graham Bell. This page wis last eeditit on 13 Februar 2018, at 07:23.